You might be wondering what "pamplemousse" is if you didn't take French in school. I didn't tell my kids what it was either until they were done eating it and saying how great it tasted. Pamplemousse is French for grapefruit. 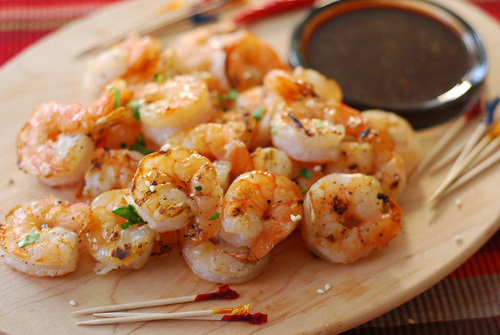 So why didn't I just say "grilled grapefruit shrimp"? First, you'd probably think "grapefruit and shrimp?" and click on to some cupcake recipe on another blog. Let's face it, grapefruit doesn't get the love that limes, lemons, and orange do. But it should. Second, pamplemousse has to be one of the funniest fruit names in another language, especially if you pronounce it incorrectly as pample-moose. Third and most importantly, it reflects the new global focus of McCormick's 2012 Flavor Forecast. 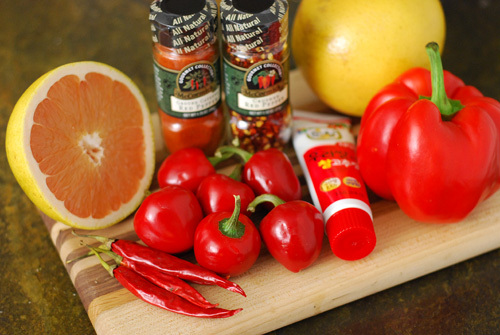 Yes, McCormick's 2012 Flavor Forecast is in and the outlook is on the future of global flavor. I recently attended an online session with the McCormick kitchens to learn firsthand about the trends and flavor pairings for the coming year. When Chef Vetter was talking about the trend of Flavorful Swaps, one of the flavor pairings was grapefruit and red pepper. One of the things Chef Vetter talked about was building multiple layers of some of the same flavors in different ways. He also mentioned the phrase "wellness journey" and I scribbled a note "A wellness journey doesn't mean you have to wander from flavor". Well this recipe keeps in line with both of those ideas. Or serve it as a meal with rice noodles and kabobs. Mix the marinade ingredients in a blender or food processor. 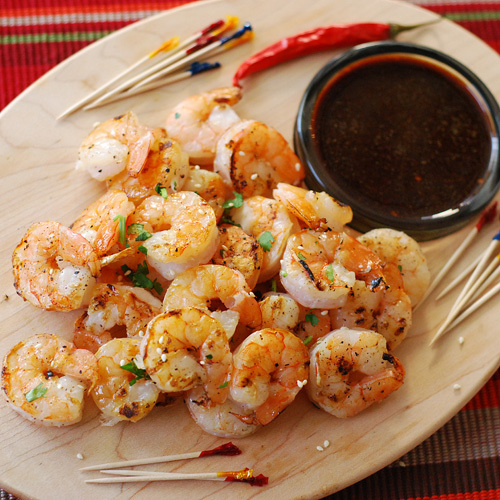 Pour over the shrimp in a zip top bag and marinate for 30 minutes to 1 hour. Mix the dipping sauce ingredients together in a blender. 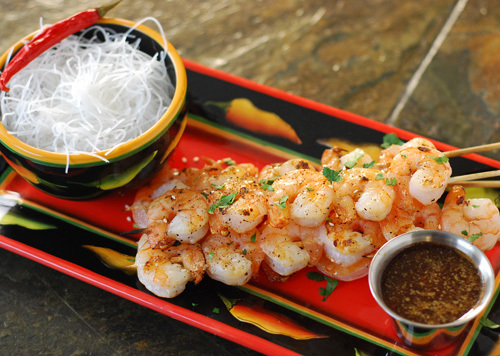 Remove shrimp from the marinade and place on skewers. 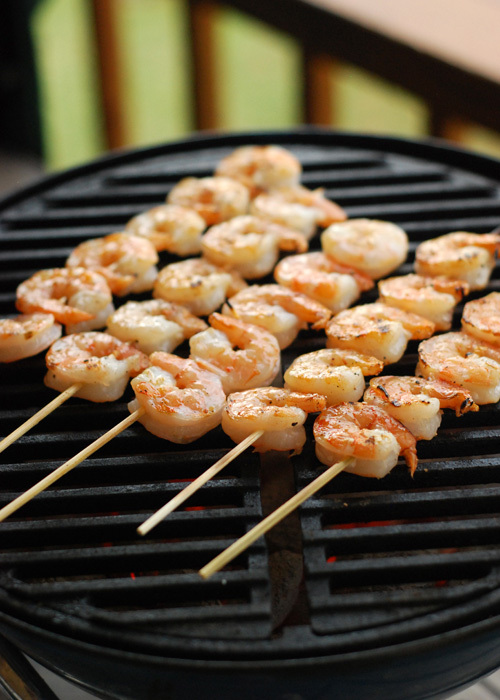 Grill the shrimp 2-3 minutes per side. Top with cilantro and sesame seeds and serve with the dipping sauce. Sweet soy sauce is completely different than regular soy sauce. If you can't find it at your local store, the closest thing I can think of is a teriyaki sauce. The dish rocked and every bit disappeared. The dipping sauce was scrumptious and had the bright, light taste of citrus. Alexis mentioned that the sauce would also be delicious with grilled scallops. My Favorite Flavorful swap - Swap oil/fat for coal - grilling avoids using extra oil for cooking. Grapefruit never tasted so good! The red pepper and citrus brought out the best in each other. For more information about the 2012 Flavor Forecast and select recipes, check out McCormick's website. I have another Flavor Forecast inspired dish coming up tomorrow! [Standard Disclaimer] I received compensation for promoting McCormick's 2012 Flavor Forecast but all opinions stated are my own.